Almost every family in every village and town in the country was affected by the horrors of the Great War, or as it came to be called, the First World War. Our villages of Botesdale, Redgrave, Rickinghall Inferior and Superior had many casualties. There are sixty-one names, of those who died, on the Memorial and several who for some reason were not put onto it. But many more who had fought were affected by the war, either physically or mentally. 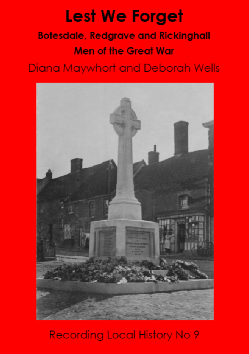 This book has been researched and written in an attempt to keep alive the memory of all those in our villages who played a part in the Great War.